May | 2018 | H.A.W.K.S. 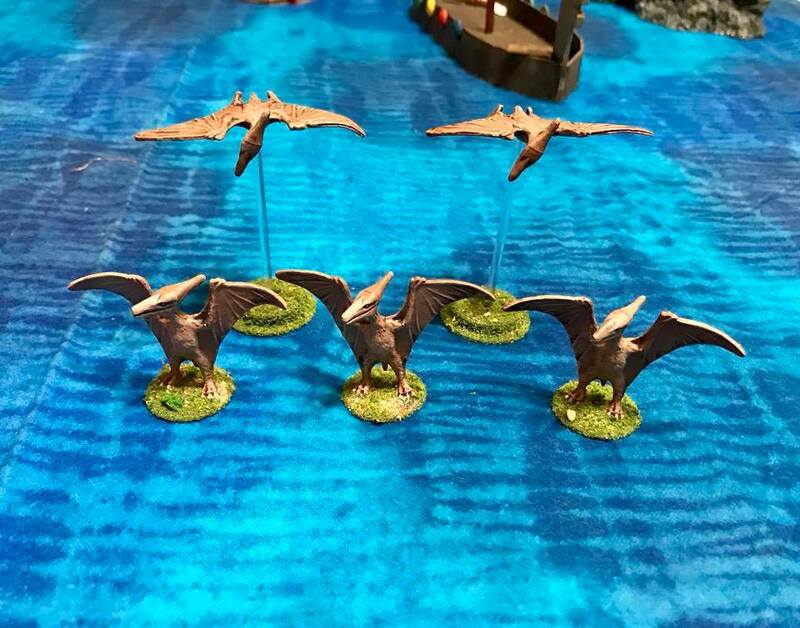 We recently finished game 5 of our 2018 Ghost Archipelago campaign. We only had 5 of our normal 8 players due to real life stuff getting in the way. 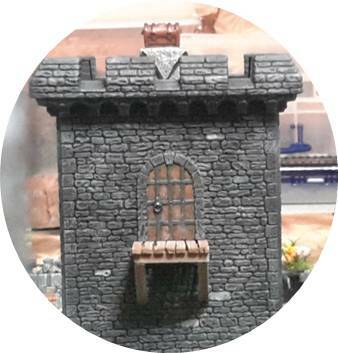 The scenario this time was the third scenario in the rule book, The Abandoned Watchtowers. With having five players, we only set-up two towers. After setting up treasures, we then drew for starting locations. As is my preference, I was able to choose a corner position to protect my flank. I happened to end up opposite Fortrywn with Herndon to my left (To read Fortrywn’s report, click here Fortrywn Game 5). The other two Heritors at the far end of the table were Kragmar and my mortal enemy, Griffin (his name is still in the book from Game 3). On board his dhow, the Raven’s Beak, Skorri sat under an awning discussing where to search next with the recently recovered Kukala (Hunter; missed last game due to injuries). Trying to sail through the mysterious islands of the archipelago in search of the fabled Crystal Pool was problematic. The dense fogs, narrow channels, shallow reefs, and seemingly shifting isles made navigation difficult at best. The old journal he has from his grandfather is oft times confusing. Its either a secret code written by a genius, or just the ramblings of a half-mad old man. And the handful of maps it contains are really just fragmented drawings with few landmarks. He had only found one map stone and it did not match anything in the journal. “Skorri, come take a look” rang out from the crow’s nest. Skorri and Kukala stood up and moved to the railing. Skorri pulled out his telescope and took a look at the nearby island. A pair of old watch towers could be seem off in the distance, rising up out of the jungle. Skorri decided they would make a good area to search, “Heave to and make ready to go ashore” he called out. The ship came to a halt, the anchor dropped, and the sails were furled. Two boats were lowered and the crew climbed in to start rowing to a small, secluded beach. It was a hot and humid as the crew set off from the beach and headed inland through the steamy jungle vegetation. The buzzing of various insects became a constant irritation. 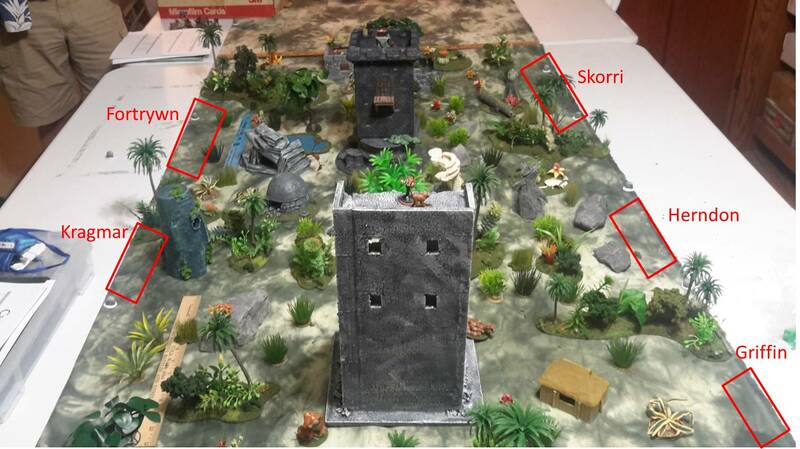 Kukala (Hunter) took the point position as they headed towards the ruined watch towers. 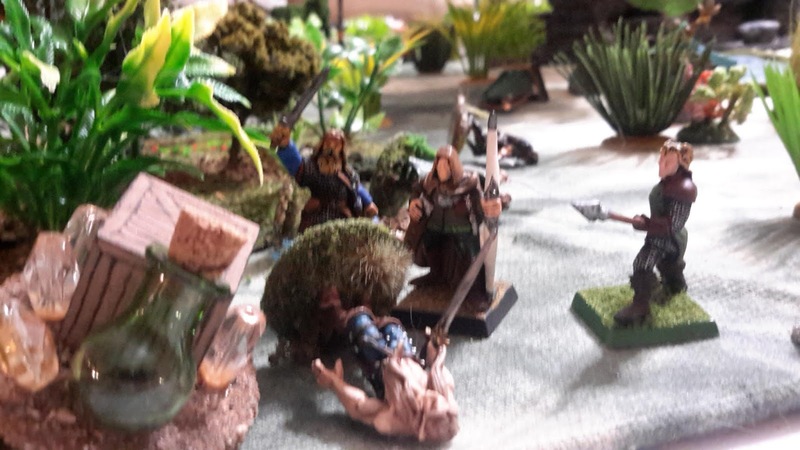 Skorri and crew moved forward through the undergrowth until one of the watch towers came into view. From the architecture and the various runes carved into its stones, Skorri was unable to determine who might have built these watchtowers. Nor could he ascertain why there were two of them built so closely together. Off to the right, he could see the ruins of two smaller buildings. These looked like they may contain clues to the mysterious towers or hopefully information to guide him in his search for the elusive map stones. 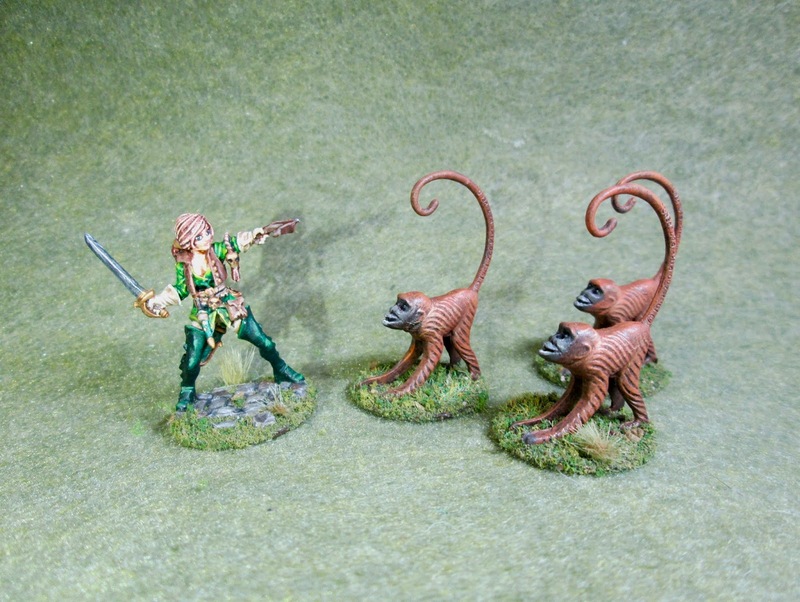 Moving up, Skorri scans the jungle vegetation. Off in the distance, he ccould make out another crew heading his way. From the foppish attire of their leader, he knew that had to be Fortrywn. Remembering the last outing at the Floating Hulks, Skorri decides he will keep the majority of his crew in a close group, except for his archers. He sends them to look for a place to provide cover for the others – and to harass Fortrywn’s crew. Kukala (Hunter) whispers, “Based on the way the birds are being disturbed to our left, I think another crew is over there and moving towards the tower." "Amras (Archer), keep a watch to the left. Let move out lads” replies Skorri. He then heads around the first ruin and moves toward the second one, Blue Boy and Chen Lee follow him (Crewmen). Kukala spies a screamer monkey on top of the nearby watch tower. Knowing these creatures have a tendency to draw other animals with their howling, he carefully draws his bow. Taking aim, he releases an arrow. It flies straight and true, hitting the monkey in the chest. The monkey falls out of sight. Agger (Beast Warden) mumbles the words to Summon Animal. Off in the distance he hears the “bzzzz…bzzzz” of a giant wasp. A wall of Brambles springs up to the front, blocking movement. Fortrywn’s warden must be nearby. Yen Lo moves towards one of the small ruined structures in search of treasure or other information. Amras and Amrod (Archers) notice some of Fortrywn’s crew moving towards them. They draw their bows, move up a little, and let loose arrows. And both fly wide of their target. The sunny day suddenly darkens as dense cloud cover begins to move in reducing visibility (Call Storm was cast by Kragmar’s warden). Skorri continues his move to the small ruined building. Once there, he spots a treasure chest in the rubble. He feels a twinge of pain as his blood start to boil as he Surges to pick up the chest. 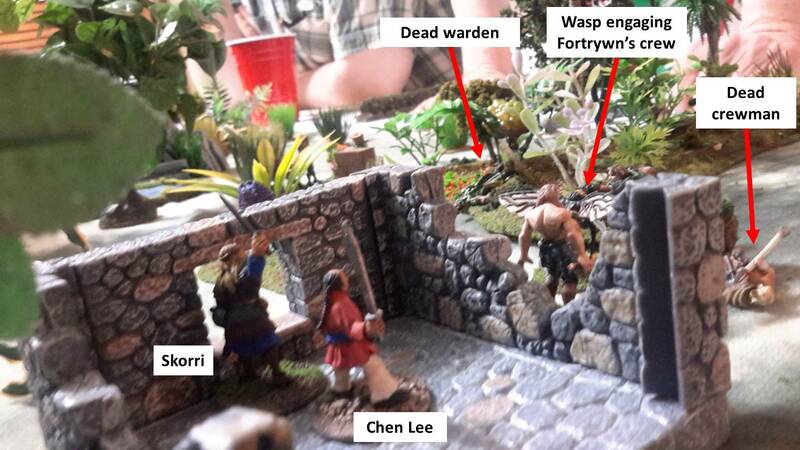 Blue Boy and Chen Lee move up to protect their Heritor as they hear the sounds of Fortyrwn’s crew moving nearby. 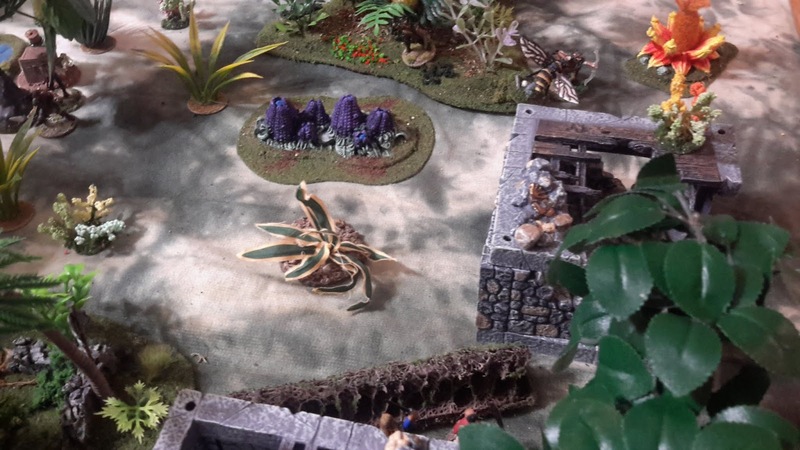 Kukala spots one of Fortrywn’s crew slinking through the jungle and takes a snap shot at him. His arrow strikes home but the crewman gets away. Agger casts Envenom on Amras’ arrow to enable the two archers to take out two of Fortrywn’s crew members; preventing them from picking up a treasure item laying in the brush. Amras shoots and misses (The poisoned arrow always misses). 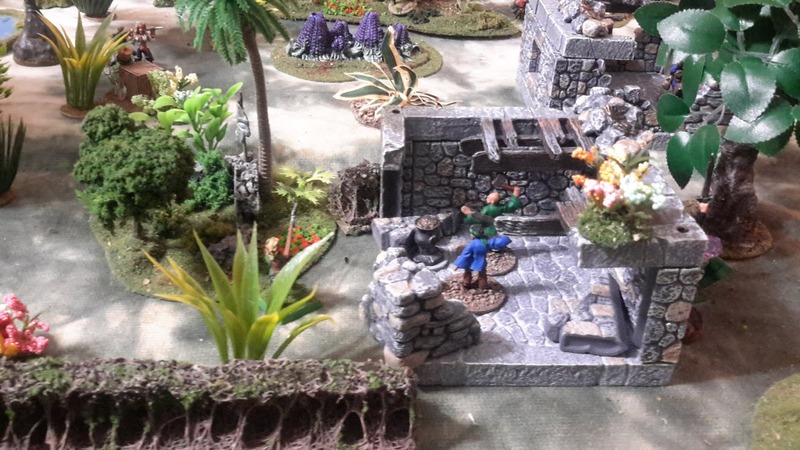 Amrod shoots and hits the treasure thief for some minor damage. Agger’s summoned wasp makes a bee-line (or is that a “wasp-line”) for Fortrwyn’s archer.﻿﻿The cloud cover starts to sink down, making it harder to mark targets (14 inch line of sight). 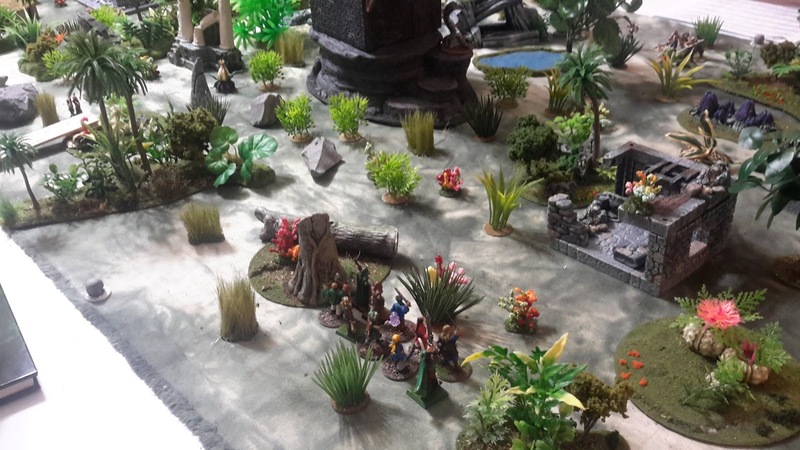 Skorri drops the treasure beside Blue Boy who picks it up and fades into the jungle, heading towards the beach. Skorri moves to a window and spots some movement in a nearby jungle area. Knowing it is not one of his own crew, his blood burns through his veins as he Surges to take a quick shot at the unknown target. He hears the arrow strike home with a loud “TWACK”, someone is hurting for certain (10 points of damage). Seeing Skorri’s shot, Kukala takes aim at the same target. He pulls back and releases. His arrow flies straight and hits his target. Kukala is surprised as the target falls into the grass and rolls into view, it turns out to be Fortrywn’s young warden. Agger again cast Envenom on Amras’s arrow, and again he misses his target. The wasp buzzes around the archer looking for an opening. The archer frantically swings his dagger to and fro and manages to nick one of the wasp’s legs (1 point of damage). Another of Fortrywn’s crew moves in to gang up on the poor beast. The wasp becomes incensed and without any hesitation, grabs the crewman with its forelegs and drives his stinger deep into his chest, killing him. The wasp turns as a sword bounces off his tough chitin shell. A third member of Fortrywn’s crew has joined in the fight. The archer sees and opportunity and cowardly stabs the wasp in the back. Somehow he found a seam between the chitinous plates and his dagger sunk deep. The wasp spasmed, his wings beating so fast it almost knocked the two humans off their feet. Then the wasp seized up and dropped to the jungle floor. Fortrywn’s crew then ran like scared rabbits into a nearby patch of jungle. Skorri moves twice to get line of sight on Fortrywn’s crew. He then Surges to take a shot but he misses his mark due to the reduced visibility. Kukala tries to climb over the barrier of Brambles but the barbs and vines catch his clothing and he is unable to free himself. Agger hears the hissing of a snake slithering up behind him. He turns and his heart skipped a beat or two – he sees an anaconda heading straight towards him. He quickly speaks the magic words for Control Animal. His success causes Agger to smile as he sends the creature off to protect the left flank. Amras and Amrod continue their cycle of shooting and missing. Return fire is more accurate as Amras is hit by an arrow from Fortrywn’s Hunter (4 points of damage). 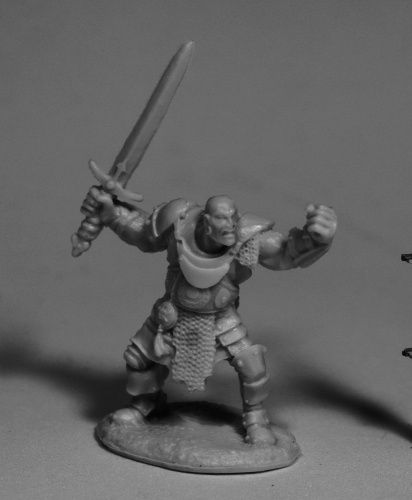 Skorri moves forward and takes a shot at Fortrywn’s elven crewman. 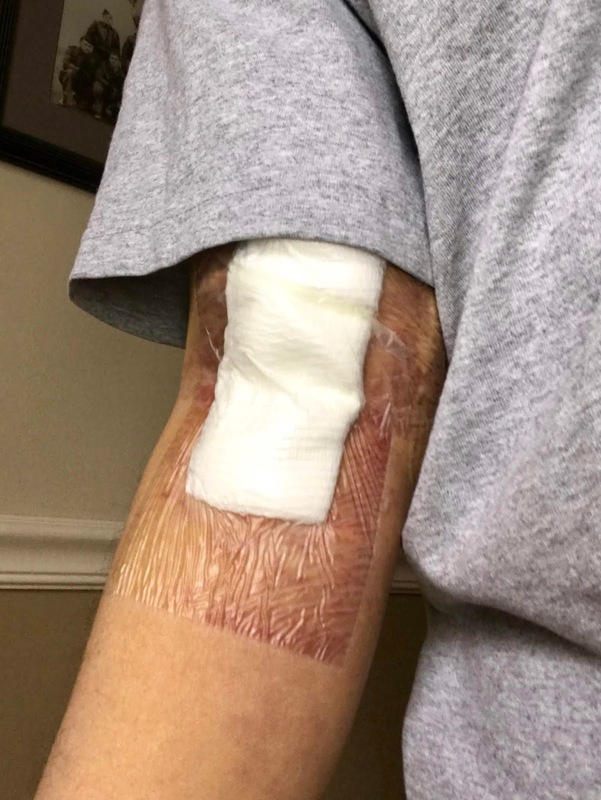 His miss causes his blood to boil as he Surges to shoot again. This time his shot is on target and the crewman slumps to the ground. Seeing Skorri moving forward, Agger casts Envenom on Skorri’s sword. He might need it. Kukala is finally able to free himself from the Brambles and takes a shot at Fortrywn. His arrow strikes straight and true but is deflected by Fortrywn’s armor. Seeing Fortrywn’s crew on the verge of escaping with the stolen treasure, Amras draws another arrow and takes careful aim. He holds his breath for a moment and releases his arrow. Amras watches as the arrow strikes his target and takes out Fortrywn’s crew-woman. Amrod lines up his shot and lets it fly. The arrow strikes the other crewman in the chest. The crewman falls to the ground. Finally a successful round of shooting by Amras and Amrod. Amras is then charged by Fortrywn himself. He tries to block his attack using his bow. Although Amras successfully deflects his thrust, he is forced to stumble backwards a few steps. He is then struck hard in the chest by an arrow fired by Fortrywn’s Hunter. 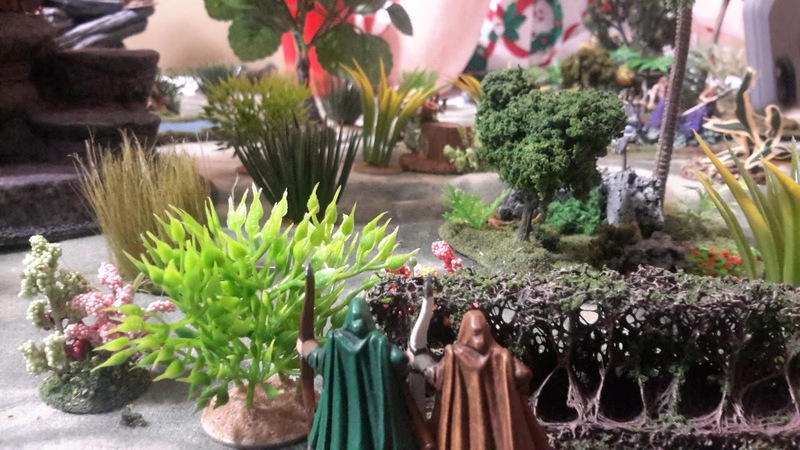 Dropping his cleaved bow, Amras falls into the jungle vegetation, never to rise again (Rolled a 1 on the recovery table). “NO!! 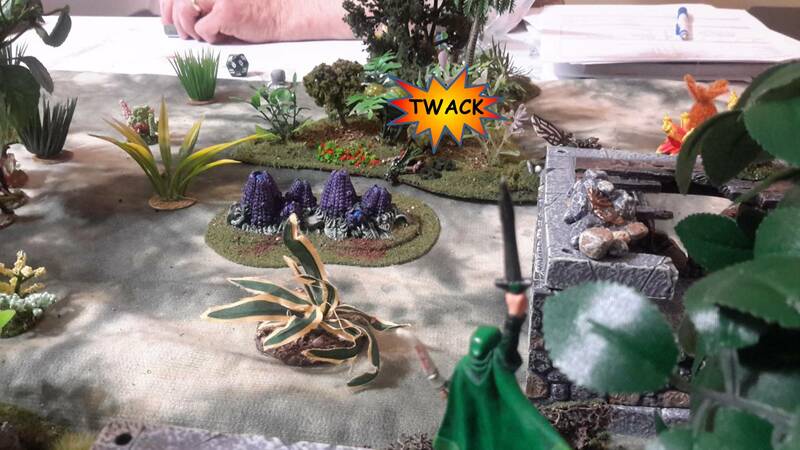 !”, seeing Amras fall, Skorri charges into to combat with Fortrywn, his sword glowing green with venom. Chen Lee also charges forward to support his Heritor. Skorri’s strike sees his sword bite deep into the side of Fortrywn’s breastplate, releasing its deadly toxin (Skorri roll: 19 + 8 vs Fortrywn roll: 18 + 5). Fortrywn is so badly wounded (14 points of damage) he can barely retain his footing as he feels the effects of the poison oozing through his body. Vengefully, Skorri lets his blood burn as he attempts a Backswing. He must have been blinded by the anger of seeing Amras fall as his backswing fails to connect (He takes 3 points of damage for failing a Heritor ability). Agger sees Skorri in pain and quickly casts Water of Life on him. Skorri feels the effect of the spell restoring some of his health as he takes up a defensive posture against Fortrywn’s counter attack. Meanwhile, seeing the treasure chest get picked up, Amrod and Taucher move to engage in combat against Fortrywn’s Pearl Diver. With a great display of swordsmanship, neither side can gain an advantage as the Pearl Diver does a good job of holding off Skorri’s crewmen.. Seeing that he is outnumbered, and over-matched by Skorri’s superior skills, Fortrywn calls upon his Heritor abilities and executes an Evade. He successfully spins around behind Chen Lee. The two exchange blows with Chen Lee taking a cut to his arm as he is forced back out of combat. Noticing that Chen Lee is safe for the moment, plus seeing the venom starting to have an effect on Fortrywn, Skorri decides to disengage. He turns to leave, as Fortrywn hurls profane insults at him. Ignoring him, Skorri rapidly moves to assist Amrod and Taucher with fighting Fortrywn’s pearl diver. As he reaches the melee, he ignores the pain and Surges to engage his opponent. His momentum allows him to deflect the pearl diver’s thrust. He then twists his blade to the left and strikes him hard with the flat side of the sword against his temple. The pearl diver collapses into the vegetation as he loses consciousness, the chest tumbling to the ground. 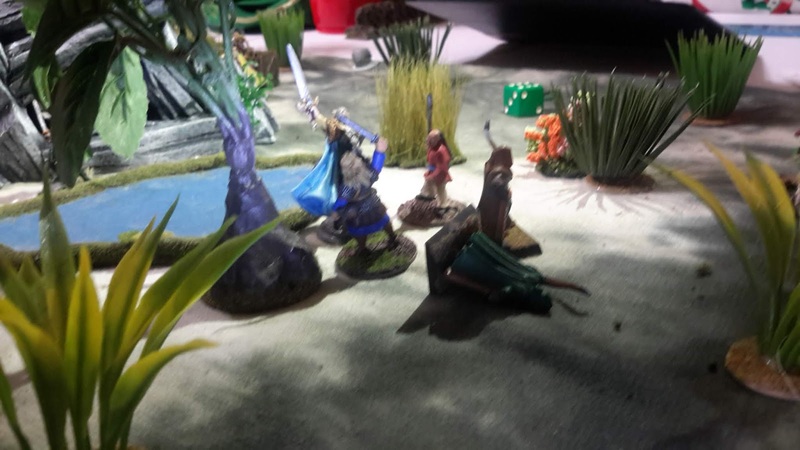 Skorri directs Amrod to grab the treasure and fall back. He does so and quickly fades into the jungle (i.e. Runs off the table). Off in the distance, the roar of a Monarch can be heard (A random creature roll). Not wanting to hang around to catch a glimpse, Skorri quickly whistles the recall signal. Before he departs, he turns and raises his sword in a salute to Fortrywn, “You lost today old boy. But that doesn’t mean you have to like it. Better luck next time." He and his remaining crew then start to move back towards the beach. A good game for Skorri and his crew recovering three treasures, even though he did lose one of his Specialists (Amras the Archer). No really worth heading back to port to just replace a single Specialist – I hope. We’ll see how the next game plays out. Keeping the crew mostly together with covering and harassing fire from the archers seemed to work well this time around. The summoned wasp helped out also diverting Fortrwyn’s crew’s attention for a while. Skorri was aided by Fortrywn splitting his crew into three teams. Of course focusing on Fortrywn did allow Herndon to have a pretty much free attempt at the central treasure on top of the tower. Herndon did have to contend with a couple half-hearted attempts by both Kragmar and Griffin but didn’t get any pictures of that action. Maybe next time I can get some action shot from the other end of the table. 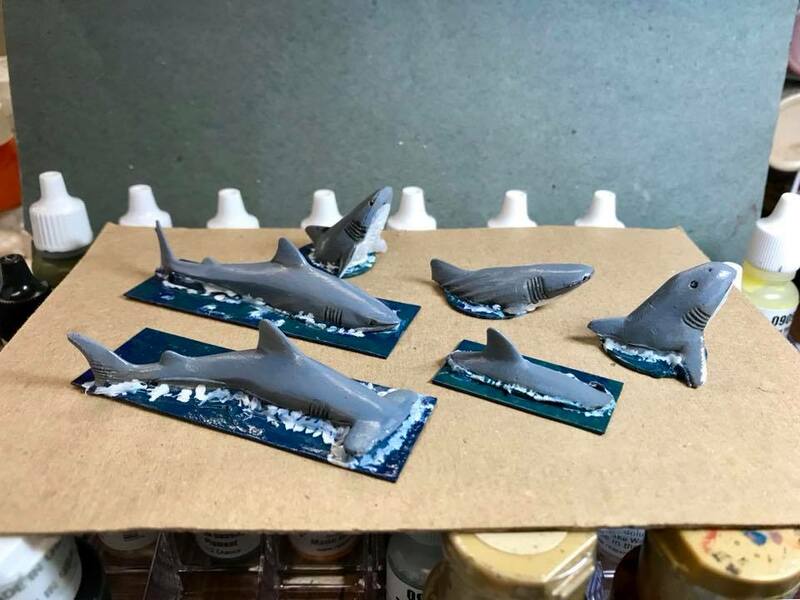 Chris Palmer Over the past several months I’ve slowly been gathering various inexpensive toys to help fill out the needed creatures for the Ghost Archipelago rules. I thought I’d compile and share some of those efforts here. 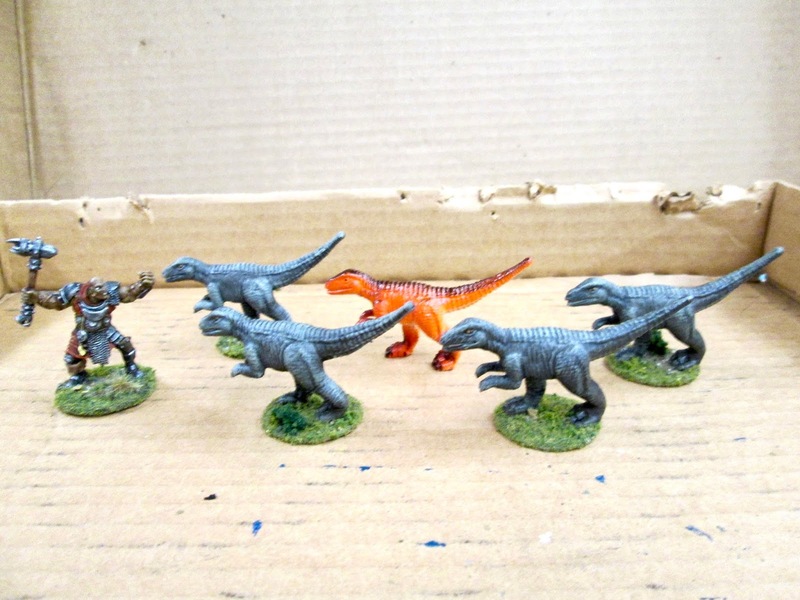 A while back I purchased a second hand tub of plastic toy dinosaurs off of eBay, and have used them to make my Talonjacks and Stalkers. 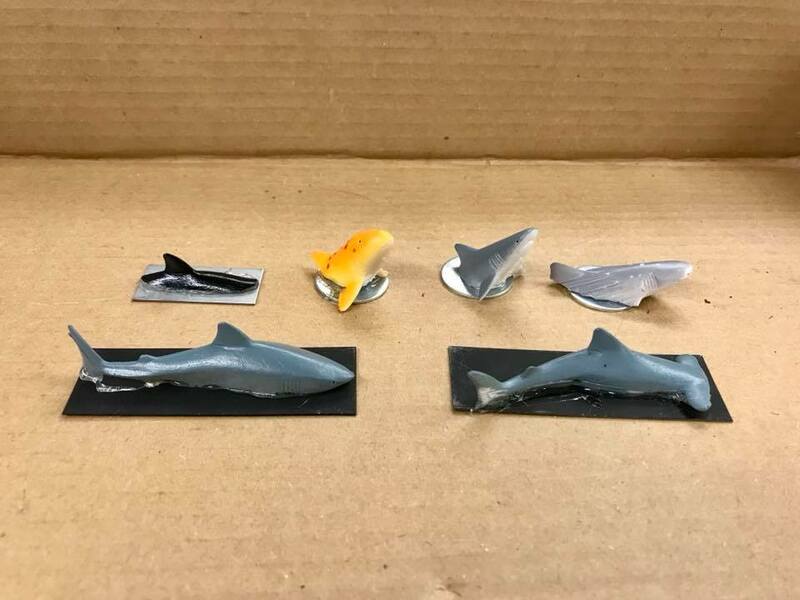 I also picked up a set of cheap plastic Sea-life toys on eBay, and converted them to be waterlined Shark figures. 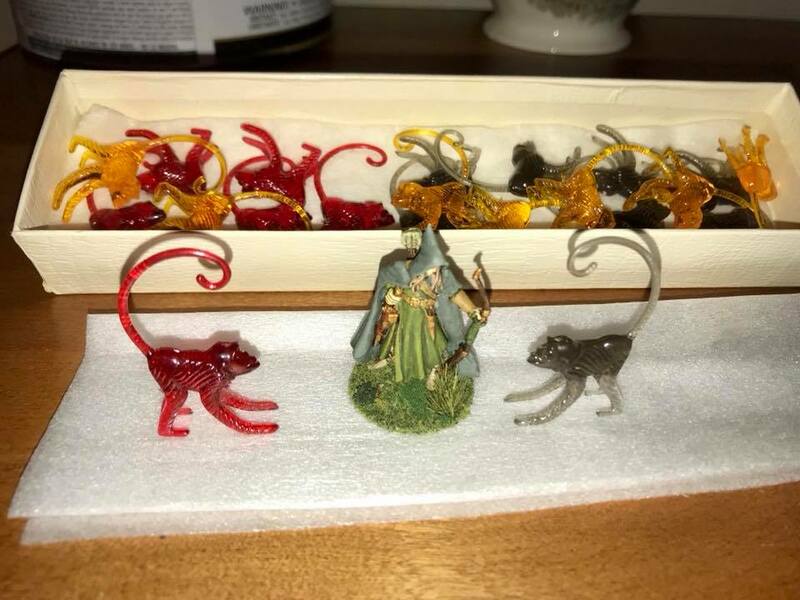 Lastly, I got some plastic Cocktail Monkeys (used to hang-on and identify cocktail glasses), and repainted them to be Screamer Monkeys. This past week, I picked a simple figure to work on; as I was still a bit limited in my ability to paint, as I continue to recover from arm surgery. 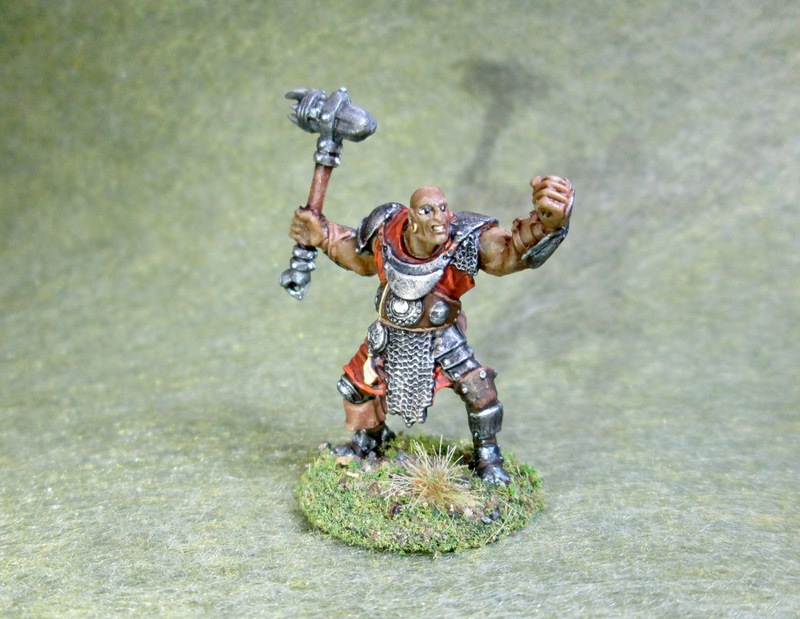 The figure I painted was the Bandit Knocker from Part III of the Stoneskull Expansion set from the Bones 3 Kickstarter. I prepped this figure in the usual way; soaking it in a dish of water with a couple drops of dish-soap added, then giving it a light scrub with a soft toothbrush, and then rinsing and drying it. I then glued the figure to a black-primed 1" fender washer with Aleene’s Tacky glue, and then placed the figure in my painting grip. I began by giving the entire figure a wash with Reaper MSP “Brown Liner”. When that was dry, I painted all his skin with Americana “Shading Flesh”. Next, I painted his armor bits with Americana “Raw Umber”, and his leggings with Folk Art Dapple Gray". I then painted all his leather bits with Crafter’s Acrylic “Cinnamon Brown”, and then did his club with Americana “Mississippi Mud”. Next, I did the patch on his right knee with Accent “Golden Harvest”, and then his boot tops with Americana “Avocado”. After that, I painted the pouch around back, and the grip of the knife in his boot, with Black. I let everything dry for a while, and then I gave his skin a wash with some Citadel “Reikland Fleshshade” wash. 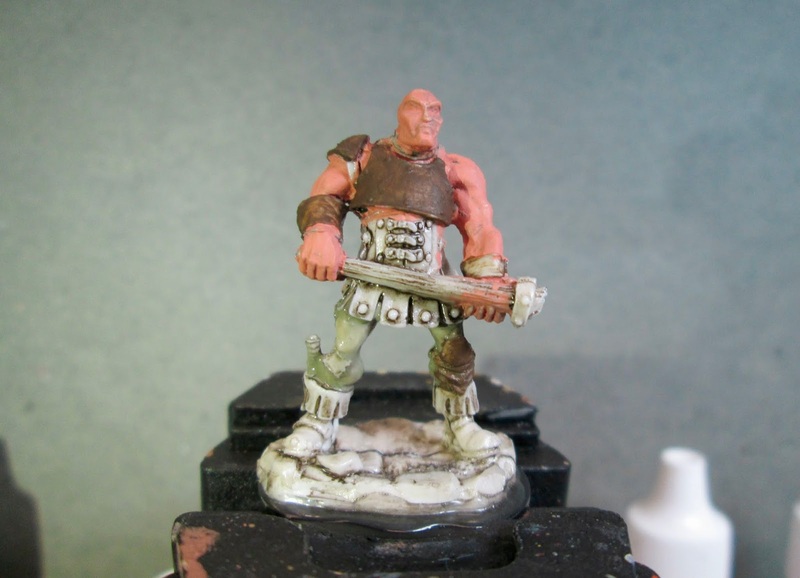 When that was dry, I gave the rest of his clothing, armor, and weapon, a wash with Citadel Agrax Earthshade"wash. 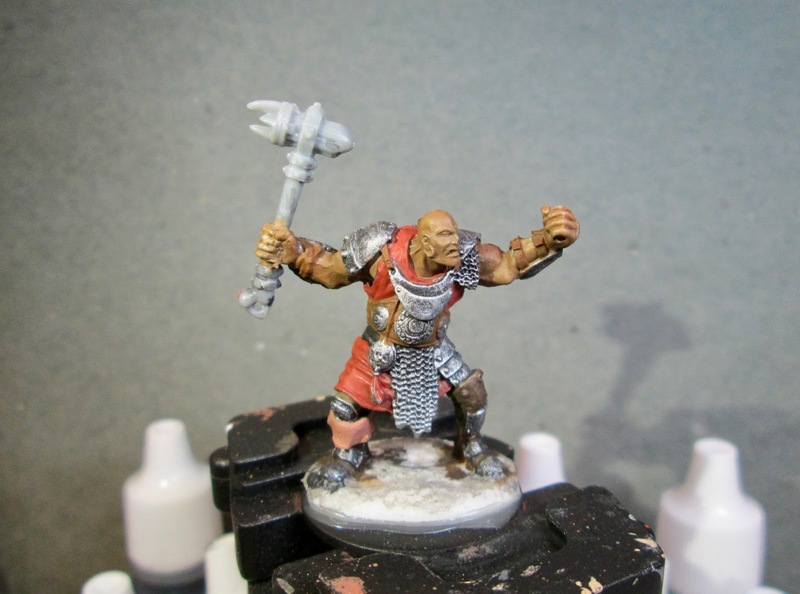 When these washes were dry, I painted his eyes, and then highlighted his skin with a mix of the base “Shading Flesh”, and Crafter’s Acrylic “Flesh”. I also gave him some eyebrows with Reaper MSP “Turkey Brown”. I then painted his armor, by first splotching near the edges with Crafter’s Edition “Spice Brown”, and then some lesser splotching with Accent “Golden Oxide”. After that I gave it a good drybrushing with Folk Art Metallics “Gunmetal Grey”. After that, I highlighted the wood of the club with Crafter’s Edition “Taupe”. I next highlighted all the leather parts with Americana “Sable Brown”. I then painted all the studs and buckles on all the leather with Reaper MSP “Scorched Metal”, and then highlighted them with the “Gunmetal Grey”. I highlighted his leggings with a mix of the base “Dapple Grey”, and some Americana “Dove Grey”; the patch was highlighted with Americana “Moon Yellow”. I then highlighted the tops of the boots with a mix of the base “Avocado”, and some Crafter’s Acrylic “Wild Green”, and did the highlights on the back pouch with Americana “Zinc”. 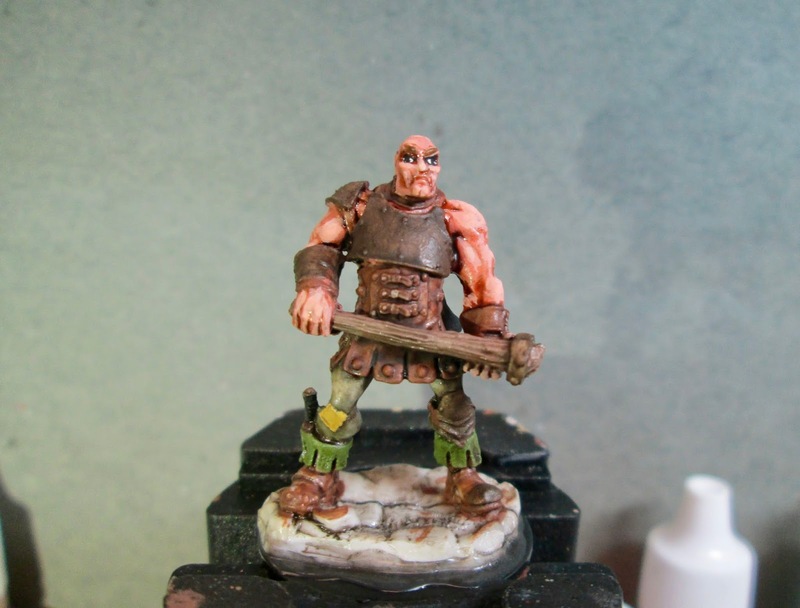 Lastly, I painted the figure’s base with the “Raw Umber”. I let the figure dry overnight and the next day I gave him a coat of Americana “DuraClear Matte” varnish. Then, when the varnish was dry, I used some white glue to flock the base. Another overnight dry, and I sprayed it with Testor’s Dullcote". When the Dullcote was dry, applied a little gloss varnish to the eye balls. Well, not a great figure; but considering I was still recovering from my arm surgery, so only had limited use of my one arm (granted it was the one that I hold the figure with, not my brush hand,) I’m pleased with how it turned out. I have been in the habit of attending Huzzah, in Portland, Maine, for several years now. This got started when my friend Ross Macfarlane had been unable to make it down to a Cold Wars for a while, and suggested that we meet somewhere halfway between his home in Nova Scotia and mine in Maryland. 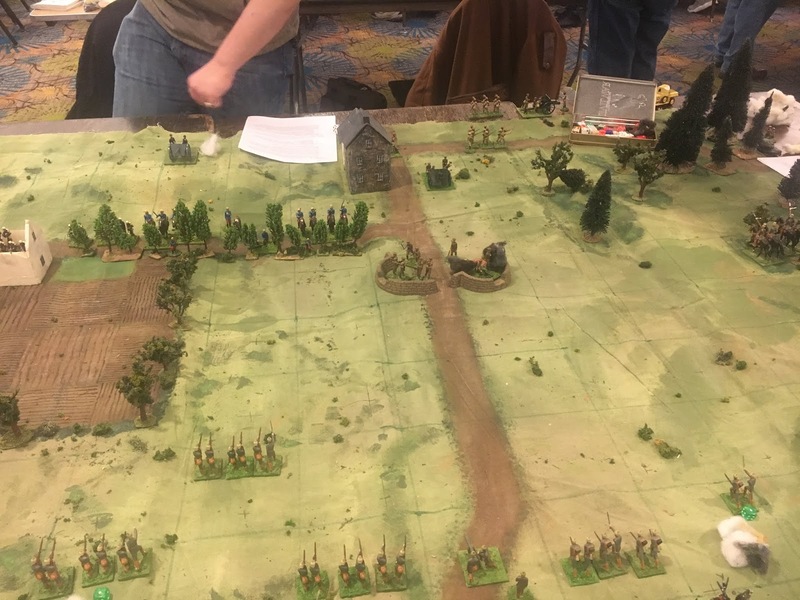 It’s a twelve hour drive for me, or a relatively short flight, which seems like a long way to go for a local convention, but between an opportunity to stage games with Ross and the fact that the Maine Historical Wargamers put on a great show, it’s worth it. 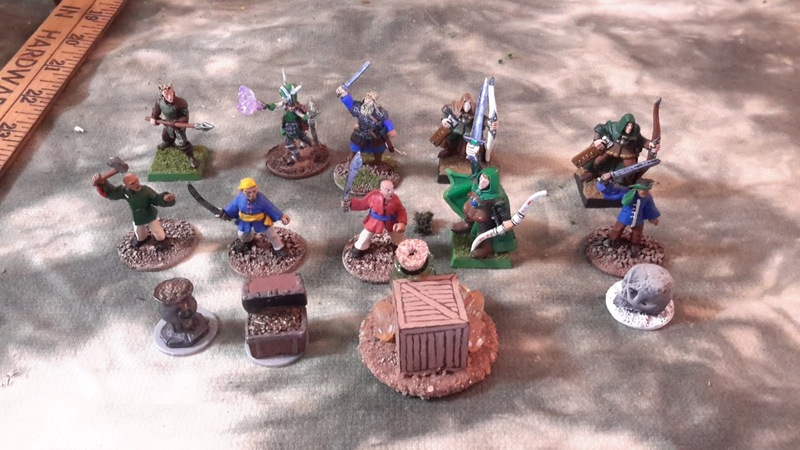 This year I had planned to fly, so Ross and I ended up deciding to run a Dragon Rampant game, using my portable 1/72 scale plastic fantasy set. 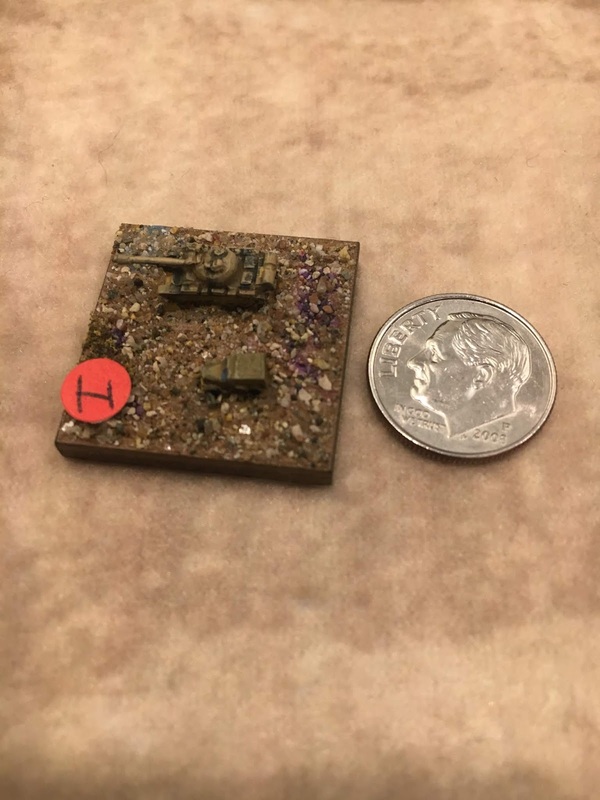 I’ve been working on the 1/72 scale plastics a fair amount this past year. For air travel, they have the advantage of being light enough to carry around, and also light enough that the bases stick to the magnetic travel boxes very firmly. The configuration shown above was from the Detroit trip mentioned in the previous post, and I had to dismount the top box to get it jammed into the overhead compartment. 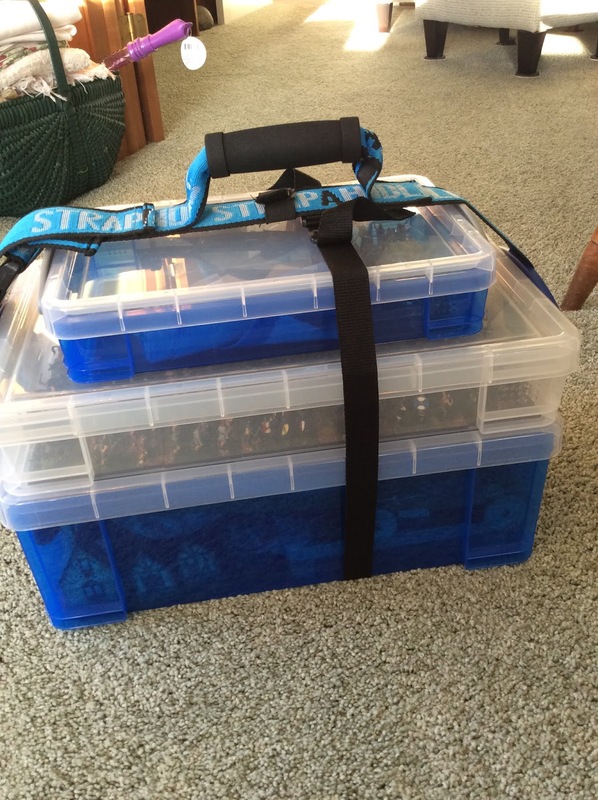 This time, I left that at home and just brought a 6 liter box with three war bands worth of troops (about 35 60mm x 40mm bases) and the 12 liter box with support gear such as scenery, dice, tokens, and rules. I had some curiosity from the TSA agent boarding in Baltimore, but no problems. Norman showed up with a fourth war band and some spares in a 4 liter box, so we had two thirds of the game in hand. 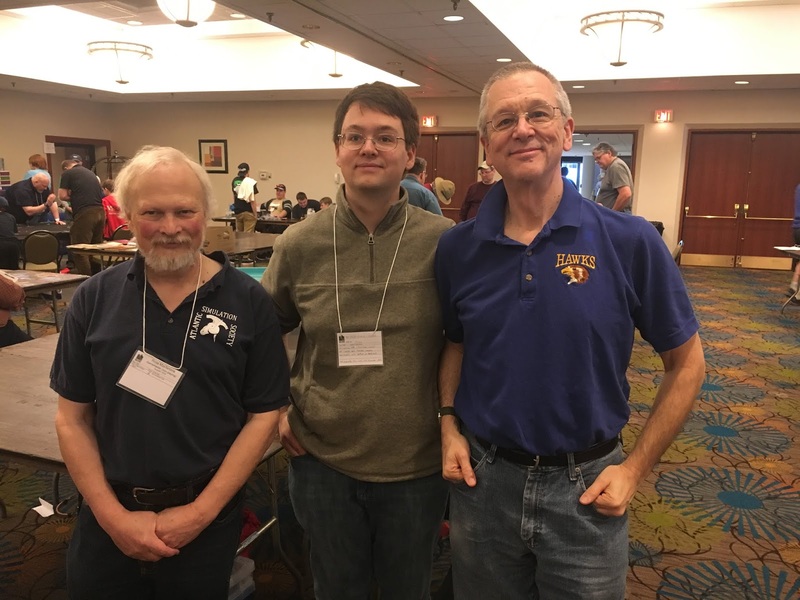 My older son, Norman, elected to come up with me this year, so I met him at the airport on Friday morning, and we had an uneventful flight to Portland, arriving at the hotel and convention venue around 10:30. Huzzah has elected for easy planning, and has each day set up with gaming time slots, so that there are two on Friday, after lunch and after dinner, three on Saturday, one after each meal, and one on Sunday, after breakfast. I have not typically had much problem getting into games, but apparently Huzzah is getting to be more popular, because most of the games were fully signed up throughout the weekend. As a gamemaster, I was registered and had a badge, but I hadn’t gotten around to signing up for anything in particular. I did a quick search through the registration books and found a few open things, which is how I ended up playing in a 1973 October War tank game using “picoarmor” and the Spearhead rules, an old set by Arty Conliffe. I was reminded that Arty’s design philosophy was that commanders were constrained in their abilities to control events, so, like Armati (his ancients rules), Spearhead seems really designed to be a two player game. There aren’t really enough decisions to spread them among multiple players. I elected to take the Syrians, which turned out to be functioning in the role of ducks in a shooting gallery. The Israeli Centurians were effectively indestructible, so it wasn’t my best game of the weekend. Ross and I neglected out “best practices” handbook a bit this weekend, mostly due to my real life being a bit hectic recently, so we had not staged a trial game of Dragon Rampant by Skype beforehand. Therefore, when he proposed that we should do a warm-up game in the Friday evening time slot, it seemed like a prudent idea. 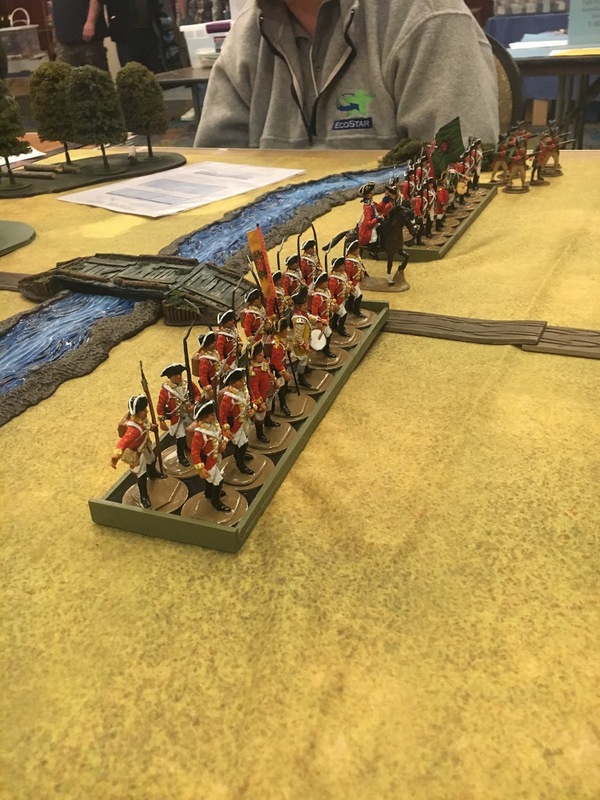 We recruited a few other players and grabbed an empty table for a simple head to head slog between the six war bands we were using for the morning game. As a result, we made some pen and ink changes on the hand out sheets; for unfamiliar players the terminology used by the game seems to be difficult to pick up. Ross had originally proposed that we use Scenario 10, The Alliance, from C.S. 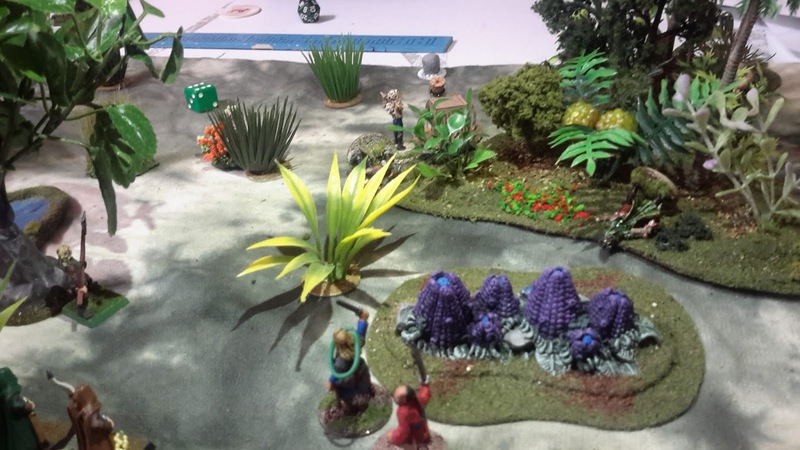 Grant’s Programmed War-games Scenarios as the basis for our Dragon Rampant game. After the Friday night test, I was generally unworried about the scenario; the game tends to be a little swingy anyway, so sticking to scenario victory conditions was unlikely to be a main concern. We modified the rules for multiplayer games by using side activation; each of the three players on a side got to act until a unit failed its activation roll, after which play passed to the enemy. We issued each player three reroll tokens, good for an activation or morale roll, so that they had some luck mitigation available in the event of bad rolls. Nevertheless, this game does work better as a two player game, and six is pushing the upper limit of what can remain fun. As Ross noted, the point values are approximate, and I’m not sure that our war bands were actually balanced as intended. On the barbarian right flank, for example, 30 points of Cold Islanders with “bellicose foot” (essentially berserkers) were unable to make any headway at all against a 24 point war band of Robin Hood-Style archers and scouts. Nevertheless, the players seemed to be enjoying the game, so we’ll call it a success and plan better next year. 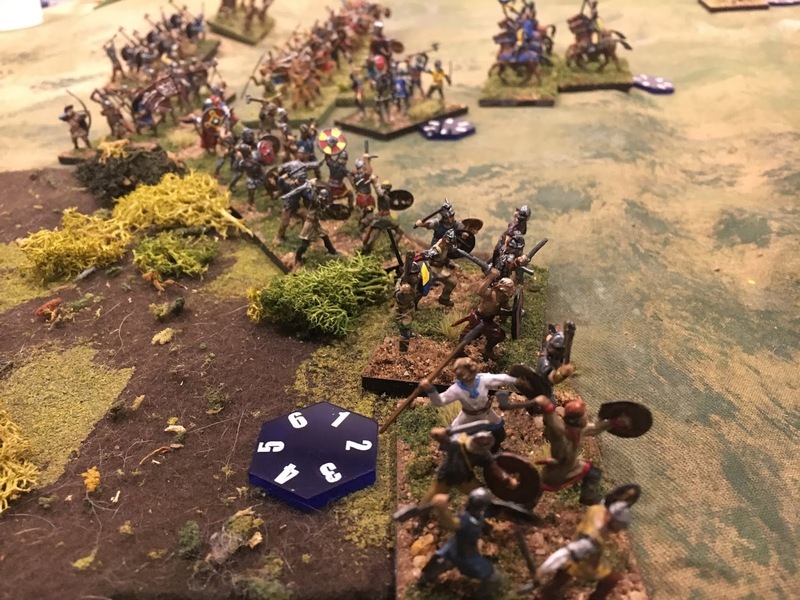 I had the tables turned on me, as it were, in the afternoon session when I found myself appointed commander of a Saxon force in a six player Saxon/Viking Lion Rampant game on account of my familiarity with the rules. I was able to get in a few solid attacks with my household mounted force, but, on the whole, the Saxon fyrdsmen seemed to be outmatched by the ferocity of the Vikings. The gamemaster used a similar concept to the reroll tokens, except that he gave out two per player and they were automatically worth a successful roll. As with my game, six players seems to me to be about the practical limit for any game in which players are acting approximately one at a time. After a leisurely supper, I was invited to play in a pick up game of Osprey’s Honours of War, which I picked up on speculation a while back (as I already have figures) but which I hadn’t read. 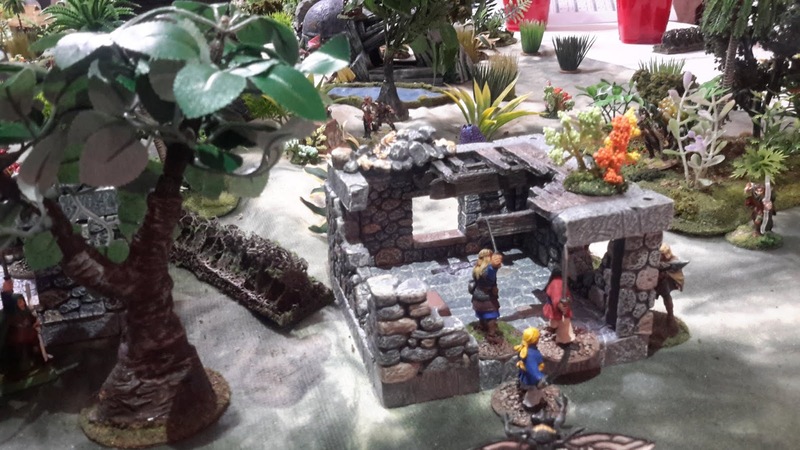 This was hosted by Al Coughlin, using 54mm figures from Accurate and All the King’s Men. I do love the toy soldier look of the big figures on the table, but the rules were probably not anything that I see using in the future. On Sunday morning, after the traditional breakfast at Cracker Barrel (next door and an easy walk from the hotel), we ended up doing a reprise of Ross’s Friday game, a 1914 scenario using home cast 40mm figures and a gridded map. I’m not a big fan of gridded maps, but I think that has more to do with not wanting to fuss with constructing one than the actual games. I took the Germans on the offensive against my son Norman’s French and British. Apart from some success on my right flank, where I was able to push my scout cavalry and bicycles up through the woods, attempting to attack the redoubt in the center of the board was a costly mistake. It needed a lot more artillery preparation, and I see how WWI offensives ended up starting with weeks of bombardment. I managed to avoid most of the shopping for the weekend, spurred on by the knowledge that everything had to go back with me as a carry-on. I did end up picking up a few books from the flea market, something on the 30 Years War, something on the Ottomans in the 16th and 17th century, and a copy of the old WRG guide to Armies of the Greek and Persian Wars, one of the few I don’t already own. Ross and I agreed to work toward a 16th century game using our 40mm collections again next year, so I guess I am committing to driving next time, as that project won’t pack in flying luggage very well. 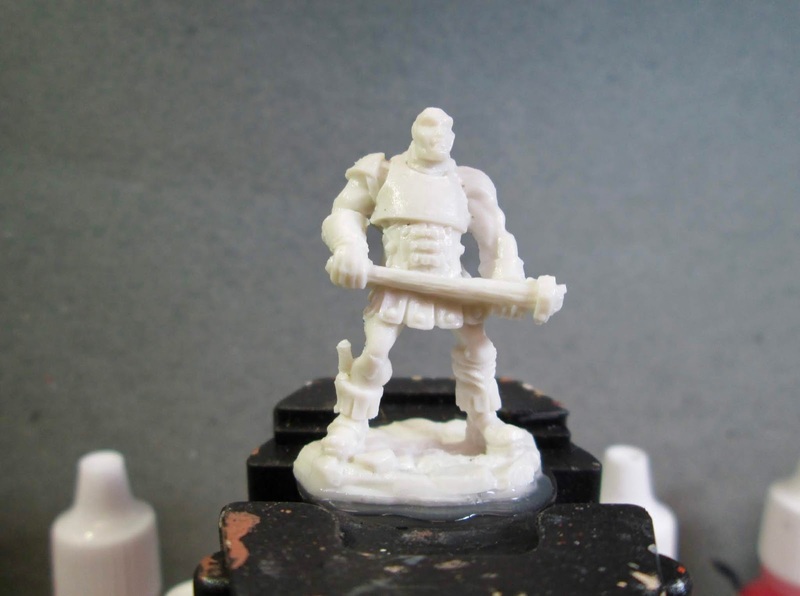 I decided it was time to add to my mold collection for the period, and ordered some sample Landsknecht molds from Berliner Zinnfiguren, which carries a range from Artidee/Creartec, while I was sitting at the airport waiting for our return flight. Overall, it was a fun convention, as always, and I am looking forward to next year. A few weeks back I ordered more ducks int he mail. They have been sitting on my painting desk for a while. 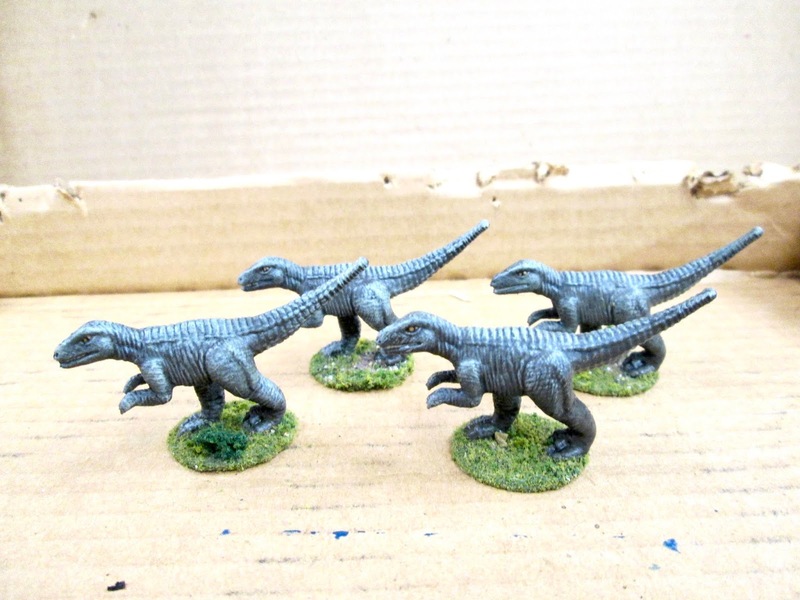 I primed them in Krylon silver, washed them in Citadel Agrax Earthshade, and then painted in the details. I am pretty happy with how they turned out. My buddy Dave can’t get enough skeletons, but there is something about ducks that I think are fun and quirky in a game. I have space ducks and fantasy ducks. If I could find a couple of Pulp ones, I would add them to my collection as well. I have accumulated a sizable collection of ducks from various manufacturers. It is becoming a sizable force. I have been trying to talk Star Hat Miniatures, who make some really nice duck figures, into selling a sprue of assorted duck heads so that I can use them to convert other figures to ducks. Some assorted duck feet would be cool too! 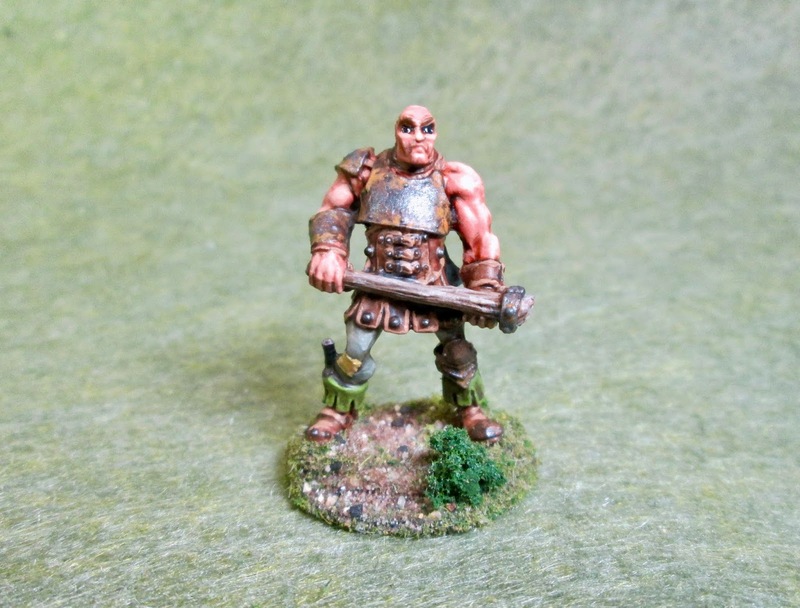 This past week I painted the Bandit Bully figure from Part III of the Stoneskull Expansion set. 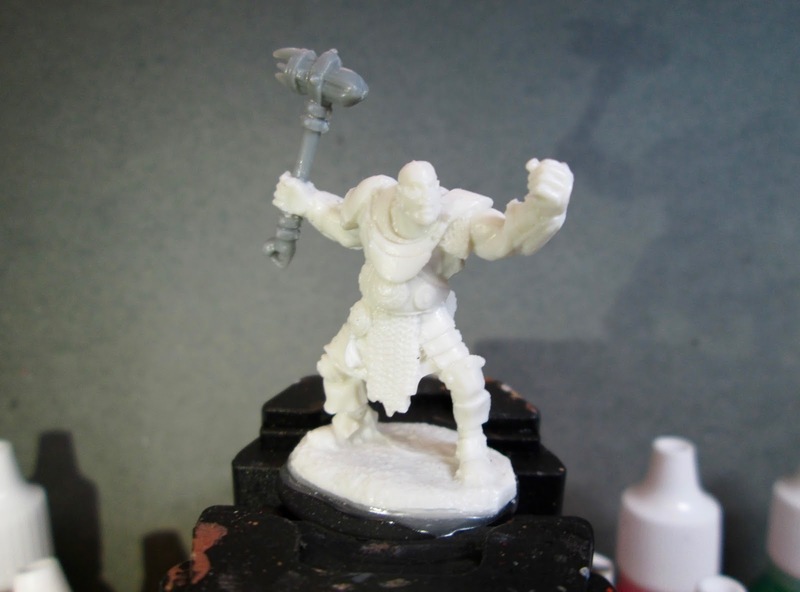 Back when my box from the Bones 3 Kickstarter arrived, he was one of the first figures I used as conversion fodder to try out some of the weapons from new weapons sprues that came with the Core Set. For this figure, I used the Hammer from the Armory of Death weapons set. He since has sat on my painting table waiting his turn. I felt it was about time i got to him. I forgot to take a photo of him in his original state, so here’s the one from the Reaper Online Store. I had prepped this figure in the usual way back before I did the conversions; soaking it in a dish of water with a couple drops of dish-soap added, then giving it a light scrub with a soft toothbrush, and then rinsing and drying it. I then had cut way his sword, and drilled out his hand. Next I cut the hand open and superglued the hammer in place, closing the hand back up. I now glued the figure to a black-primed 1" fender washer with Aleene’s Tacky glue, and then placed the figure in my painting grip. I began by giving the entire figure a wash with Reaper MSP “Grey Liner”. When that was dry, I painted all his armor with “Black”, and when dry, I drybrushed it with reaper MSP “Aged Pewter”. 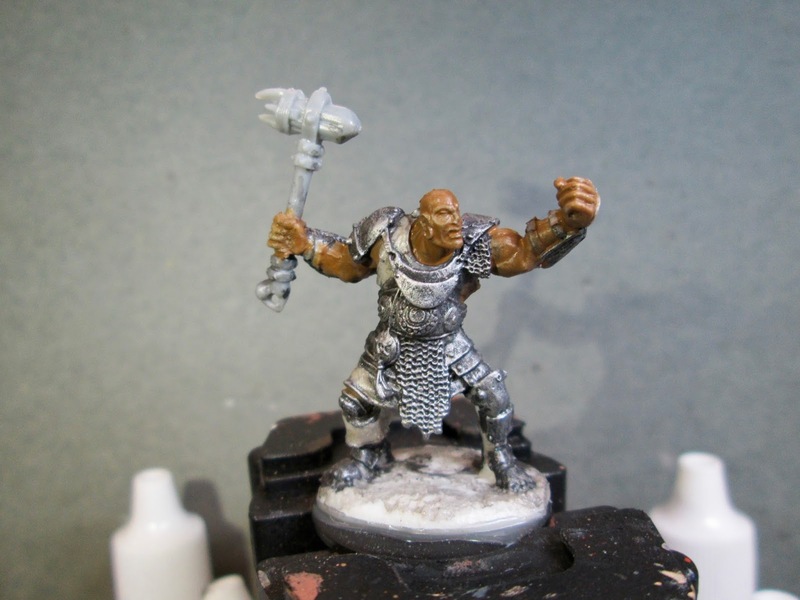 I then did a lighter drybrush with Ceramcoat “Metallic Silver”. After that, I painted his skin with Reaper MSP “Olive Skin Shadow”. 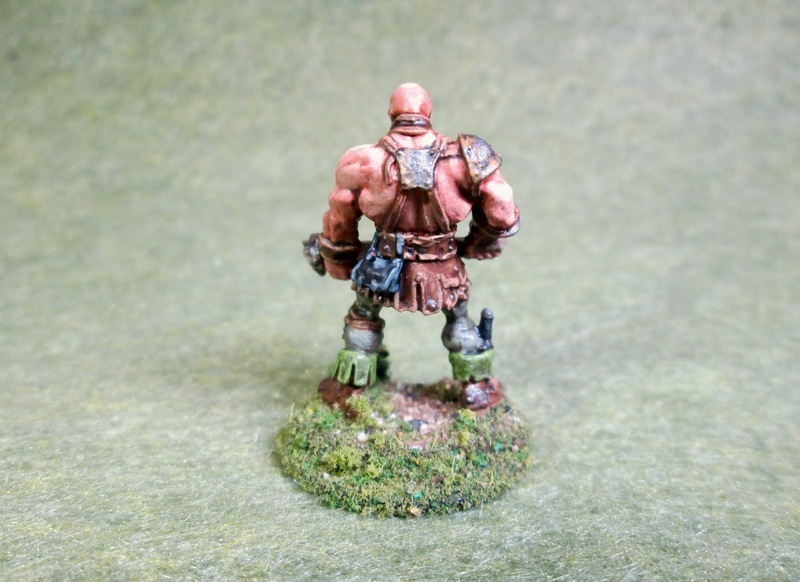 Next, I painted his tunic with Anita’s “Burnt Sienna”, and then did his boots with Americana “Bittersweet Chocolate”. I then painted the top of the folded down boot with Folk Art “teddy Bear Brown”. After that, I painted his belt and straps with Reaper MSP “Turkey Brown”, and the pouch on his back belt with Americana “Mississippi Mud”. I then painted the handle of his hammer with Crafter’s Acrylic “Cinnamon” Brown", the dangle on his hanging belt medallion with Accent “Golden Harvest”, and the cord holding the medallion with Americana “Antique White”. 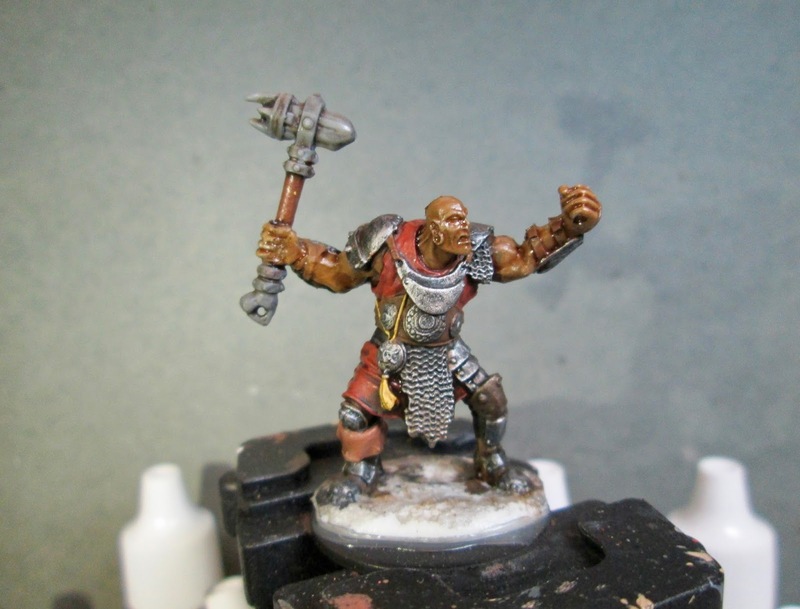 After that, i painted the metal parts of his hammer with Americana “Zinc”. 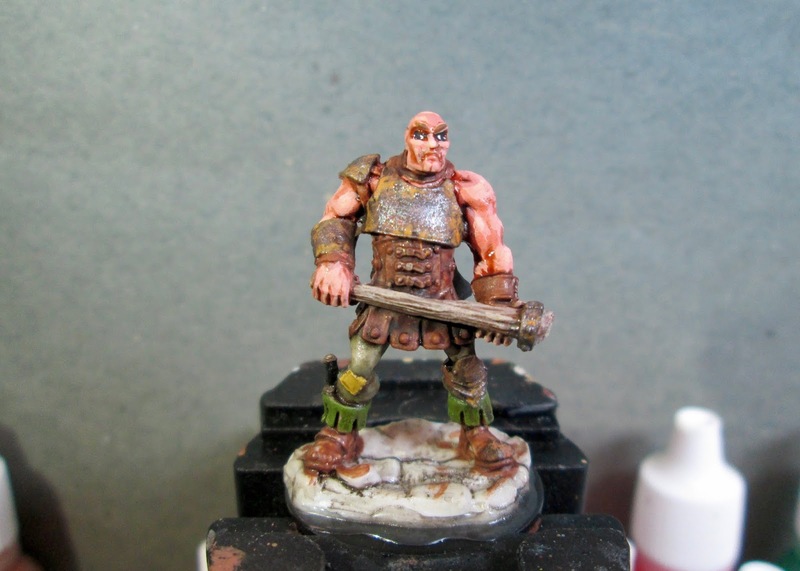 Then, when everything had a chance to dry, I gave his skin a wash with some Citadel “Reikland Fleshshade” wash. 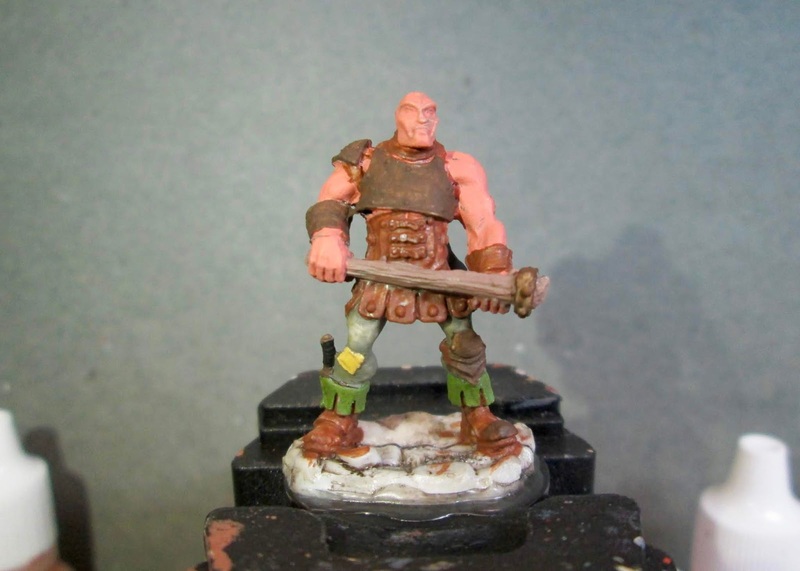 When that was dry, I gave the rest of his clothing, armor, and weapon, a wash with Citadel Agrax Earthshade"wash. When the wash was dry, I painted his eyes, and then highlighted his skin with Reaper MSP “Olive Skin”, and Reaper MSP Olive Skin Highlight". 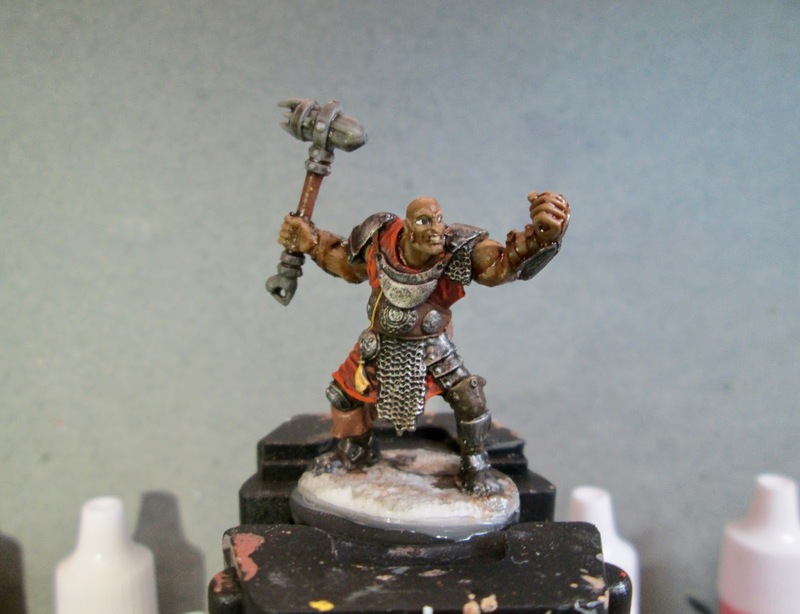 I painted his teeth with the “Antique White”, and then highlighted his tunic with Crafter’s Acrylic “Orange Spice”. Next, I highlighted his boots with Crafter’s Edition “Spice Brown”, and the folded over top with Ceramcoat Territorial Beige". I then highlighted the belts and straps with Americana “Sable Brown”, and used a little of this color to add some highlights to the hammer handle. After that, I highlighted the fringe on the hanging medallion with Crafter’s Acrylic “Daffodil Yellow”, and the string holding hit with the base “Antique White”. 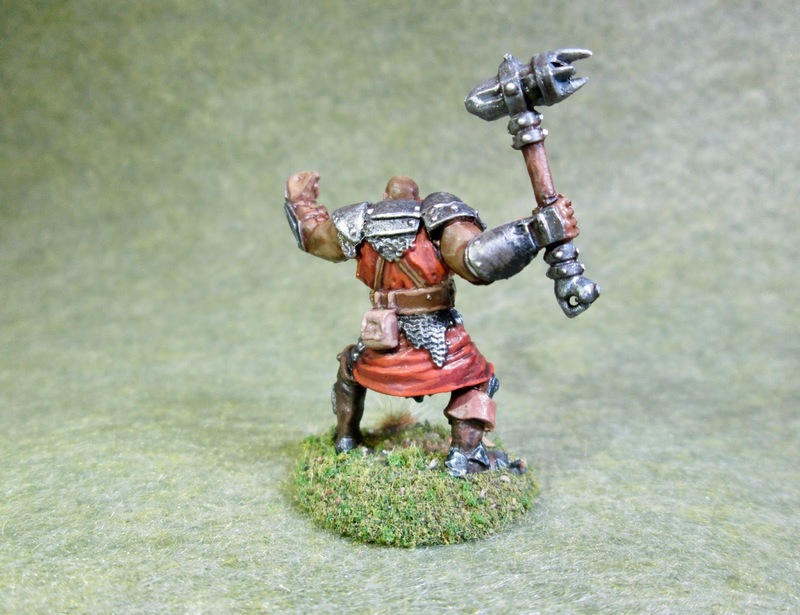 I then painted the hammer with Folk Art Metallics “Gunmetal Grey”. Afterwards, I highlighted all the metal with Ceramcoat “Metallic Silver”. I also painted his earring with Ceramcoat “14K Gold”. Lastly, I painted the figure’s base with the “Bittersweet Chocolate”. I let the figure dry overnight and the next day I gave him a coat of Americana “DuraClear Matte” varnish. Then, when the varnish was dry, I used some white glue to flock the base. Another overnight dry, and I sprayed it with Testor’s Dullcote". When the Dullcote was dry, I tried an experiment, and applied a little gloss varnish to the eye balls. I think it looks ok, and actually provided a little reflective dot in his pupil which I didn’t have to paint. 🙂 I’m really happy with the figure, though I think his skin is a little darker than what I wanted for olive skin. I think next time I will skip the Shadow layer of the skin triad, or skip the wash. I think both together was a little too dark. Dave Wood, Greg Priebe, and I got together this Saturday for a session to work on the LSNC: SciFi rules. We focused on the cyber fight and spotting. It really needed to be a small event, because we were changing the rules on the fly, sometimes during the same turn. In the end, I think we worked through a number of challenges. There is only so far I can go in my head while running. 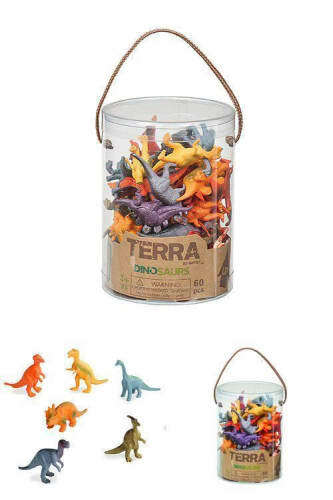 At some point you have to put figures on the table and see how it works in practice. I think the spotting rules feel pretty good. I was hoping to use the same spotting dice as the original WWII rules. We tried a bunch of different things but eventually came back to that. The trick was to reflect visible and thermal sensors at different ranges. In the end we are going to use the normal spotting dice, but go to long and short range instead of losing a die for every 10″, and add an additional (special thermal) die if the unit has thermal sensors. For the play test games, we are not affixing the normal base labels but using rosters. The cyber fight worked very well, I think. At some point, I’ll probably ask Sally 4th to make some MDF “cribbage board” looking game aid to keep track of the status of the cyber fight. I also want to explore having special cyber dice created. Depending on how a side’s cyber forces are doing at penetrating the enemy’s networks, the side can hold some number of cyber effects cards that they can play during the turn. Both Dave and Greg used theirs effectively to slow down or disrupt the enemy. Greg was having an unusually hot dice day, and he was spanking Dave’s forces left, right, and center even though Dave had the upper hand on the cyber fight for most of the game. Both sides started with identical forces in a meeting engagement. This was about testing the rules, not winning a game or testing a scenario. At the end we started to test the radio frequency (RF) spotting and firing RF-guided munitions, but by that point in the game, Dave’s forces were shredded and we called it a day. We are bringing the rules to a club game on 1 June, so stay tuned for further updated.